Over the last month, I’ve found myself engaged in 4-5 separate conversations about hope. The general context was in reference to students and their future but even more specific to those students who may not come from backgrounds where hope is prevalent. I have spent my entire educational career in school districts where the free-reduced rate hovered around 50%. I have worked with players and students who have come from backgrounds that I can’t even fathom. Yet, some of them have held more hope than anyone I have ever met. As my participation in those discussions increased, so did my desire to read and research even more. Thus, my journey began. Fortunately, I am blessed to work with some amazing thinkers and educators. When I encounter an area that I’d like to delve deeper into, resources are simply fingertips away. One colleague that has consistently impacted my thinking and pushed me is Anne Kostus, a principal at Cedar Springs High School. Anne is a truly gifted educator and I admire her for that. But what I most admire is her complex and deep thinking, which can leave a lasting impact on a student, colleague, or stranger, with a single conversation. She shared some words at a meeting I was at last week, that made me realized I have only scratched the surface in understanding hope as it relates to students. 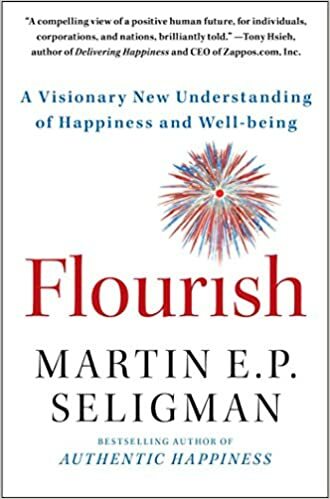 Anne referenced (and later bought me, bless her heart) a book called, Flourish, by Martin Seligman. There was a conversation going on about success, potential, and how that can be measured in students. Anne referenced the work of Dr. Seligman and his theories on flourishing, getting the most out of life, and how our opportunity to paint that picture to students is of vital importance. Anne made me realize I had a lot of reading and researching to do in order to better understand hope. You see, I sell hope every day. Every single day. I have for many years. I sell it to kids that have plenty, kids that have some, and kids that have none. I’m a dreamer and I want my fellow educators and students in our school to DREAM BIG! We have #ChaseIt signs all over our school, with the goal being to let our students know that they are capable of greatness and that chasing that greatness is a lifelong journey full of learning. But as I read this book, I am starting to realize it’s more than developing a brand and “selling” it to kids. We have to paint the picture for our students, using intentional and consistent word choice, components that are specific to their daily struggle, and do so when times are good and when times are tough. That has to be done while developing meaningful relationships and having deep conversations. We need to talk to students about finding their true talents and cultivating them as lifelong learners. There has to be a focus on the importance of how they develop relationships and how important it is to make a contribution to your community. Kids have to know we believe in them and are willing to show that belief with investment in time and effort. Sometimes, we think we know more about something that we do. That was the case for me and how I need to assist my students in understanding, developing, and holding onto hope. I was once giving them the starting line and the finish line, but no map. Thanks to conversations with talented peers, community members, Anne, and Dr. Seligman, I am going to be better armed to show them the map and all the steps along the journey. I guess that is what being a lifelong learner is all about. I can’t wait to learn more and better support students who desperately need to get to know, understand, and embrace the importance of hope in their lives.